For the interviewees privacy and protection, last names were withheld. The results of the election have angered different communities, one being the Latino community. Undocumented Latinos fear many of the proposed actions promised by President Donald Trump. People are now speaking about the new devastating era that will affect their lives. 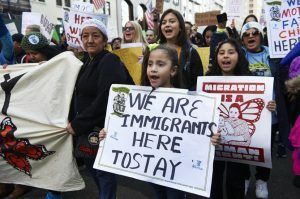 Some people are devastated because Trump has promised and rallied for mass deportation, removal of Obamacare (Affordable Care act) and the construction of a wall to secure the US–Mexico border. Some do not understand the dangerous effects Trump has on Latinos; he intends to separate families as well destroy their dignities. Though his comments were specifically towards immigrants, United States born citizens were equally discriminated against. Mercedes, a 52-year-old Mexican immigrant woman, spoke about how the situation has affected her. “It has not affected me physically because I have a permit to be here, but it has affected me mentally. I think about the low chances I have to become a citizen,” said Mercedes. Not only has it affected older immigrants, but younger generations are just as upset. They fear being taken away from their families since most Latino families are immigrants. “I’m scared. What will happen to my parents? Will they get deported? Where will I go?” commented Gabriela. Listening to questions similar to those of Gabriela helped me understand their distress. She should not be questioning or fearing for her parents, let alone herself. I am part of the Latino community. I am an American citizen born and raised in Los Angeles, most of my family is here illegally. Other groups like African Americans and the LGBTQ community will be severely affected by Trump’s proposed policies as well. I see and sense the pain, fear, and hopelessness in my own home. My parents are undocumented and have been in the process of becoming citizens since 2000. They are not criminals as they are inaccurately described or predicted to be. My parents spoke to me about the custody of my sibling, in case they are deported—an extremely difficult subject to speak about. I too question my status in America. What will happen if my parents are deported? Will I have to leave the university and help them? It is a terrifying situation. I know it will be difficult to pass such a law mass deporting immigrants. However, I am primarily afraid of the racist and prejudice people that have surfaced since the election. It was tough processing what occurred on election night—I was shocked—I cried after the results. I truly thought Trump was going to lose. Although I am not an immigrant, I am part of the Latino community so, I am treated the same way. The day after the election, two women expressed their excitement regarding the election results. “Aren’t you happy Donald Trump won? I am. I was tired of Obama, Hillary, and their entire office,” said a woman of Caucasian descent around the age of 70. I understand that everyone is entitled to their own beliefs and opinions, but it hurt to hear such dreadful comments. “I feel angry and sad. He’s a racist and he’s not polite to people. He’s rude and such a hypocrite,” said a 13-year-old named Gabriel. As Americans, I believe we should be proud of the decisions we make together—but not this time. “He’s going to deport a lot of people. He says Mexicans are rapists and they’re creating crimes. That is not true, people are here to have better lives and not deal with the bad that comes from where we’re from,” mentioned Gabriel. No one should have to fear or doubt their legal status. “People are scared to be taken out of here. No one has stability or a secured home in Mexico. Our parents and grandparents are not even here anymore,” said Mercedes. Many immigrants have made their lives in the United States and have no recollection of their birth place. “Our parents came to the United States to have better lives,” mentioned Gabriel. “Our lives are here and we have no second home to run to if our parents get deported,” said Mercedes. The same person who wants to unite America, is the same person who has crumbled it into pieces. I believe that some did not take the election seriously enough and were sure Hillary Clinton would win, but reality struck and many Latinos were disappointed. There is no doubt that Trump will detrimentally affect the Latino community. We have many undocumented people in the Latino community, and we must fight united. We should confide in one another and remind all immigrant families that they are not alone. This is the time to be advocates to all minorities groups who will suffer from Trump’s presidency.